Olivier Ménage, Patrick Rousseau, Fabrice Le Bars, Luc Jaulin, etc. Vaimos is an autonomous sailboat robot. 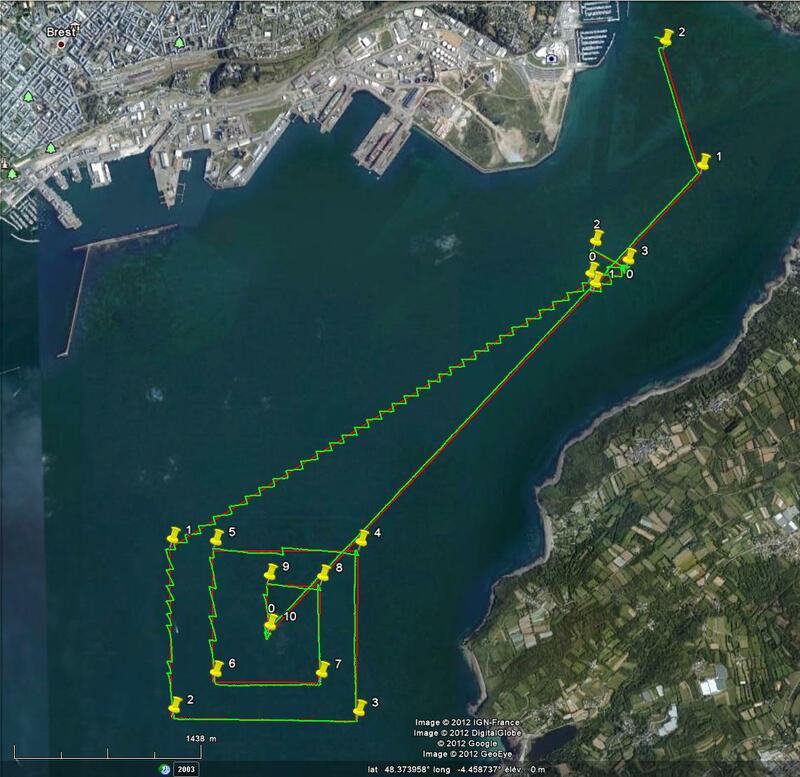 Its goal is to collect measurements at the surface of the ocean. ENSTA Bretagne (OSM) develops control algorithms and the software architecture. IFREMER (LPO+RDT) builds the mechanics, the embedded instrumentation, the electronics, etc. Control. The robot follows a desired trajectory which is a sequence of lines. The robot has two modes. (ii) the tack mode: the distance to the line is less than 100 meters. Explanations of the controller during the conference IRSC, Cardiff. Symposium Biarritz 2011, Vulnerability of coastal ecosystems to global change and extreme events. 18 to 21 October 2011. Voilier Autonome Instrumenté pour Mesures Océanographiques de Surface. L. Jaulin, F. Le Bars , B. Clément, Y. Gallou, O. Ménage, O. Reynet, J. Sliwka, B. Zerr (2012). 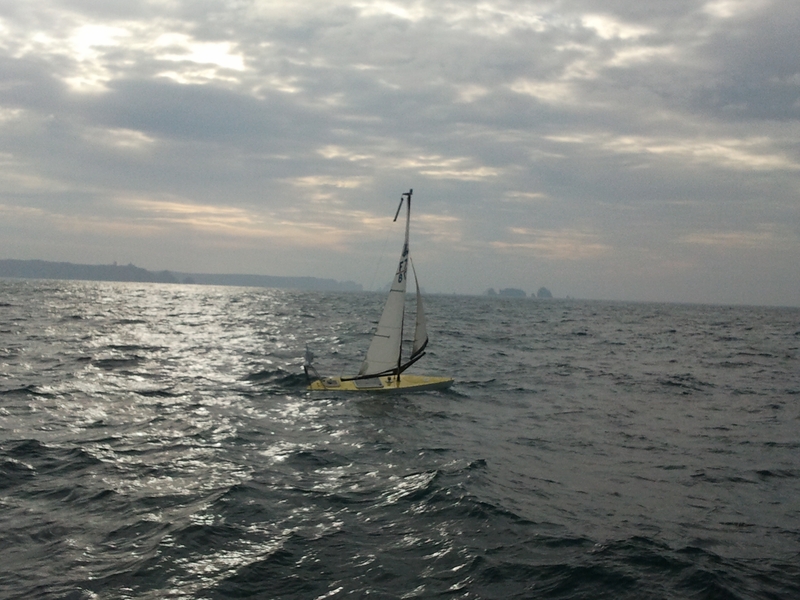 Suivi de route pour un robot voilier, CIFA 2012, pp 695-702. T. Gorgues, O. Ménage, T. Terre, and F. Gaillard, An innovative approach of the surface layer sampling, Journal des Sciences Halieutique et Aquatique, vol.4, pp.105-109, 2011. L. Jaulin and F. Le Bars (2012). An interval approach for stability analysis; Application to sailboat robotics. IEEE Transaction on Robotics, Volume 27, Issue 5. L. Jaulin and F. Le Bars (2012). A simple controller for line following of sailboats, In Proceedings of the 5th International Robotic Sailing Conference (Springer Eds. ), Cardiff, England. F. Le Bars and L. Jaulin (2012). An experimental validation of a robust controller with the VAIMOS autonomous sailboat, In Proceedings of the 5th International Robotic Sailing Conference (Springer Eds. ), Cardiff, England. Saint Anne (Tuesday, september 22, 2011). Logfiles of the mission. Moulin Blanc (Tuesday, october 11, 2011). Two identical missions were asked: one the morning and one the afternoon. The red lines correspond to the desired trajectory and the green curves correspond to the GPS tracks. Brest, Spiral, with the Keep Close Hauled strategy, June 28. Program C++ with QT creator and OpenGL (codes, exe and dll). Dashbord we use for Vaimos. Vector field to illustrate the controller. Vaimos, pendant la campagne Strasse, au mileur de l'océan Atlantique (avec le Thalassa d'IFREMER). Vaimos à Angers pendant les journées démonstrateurs. Thesis on saiboat robotics by Miguel Romero (specially interesting for the potential method and the state-of-the-art).